I mean, seriously. Nothing good or happy to see here. 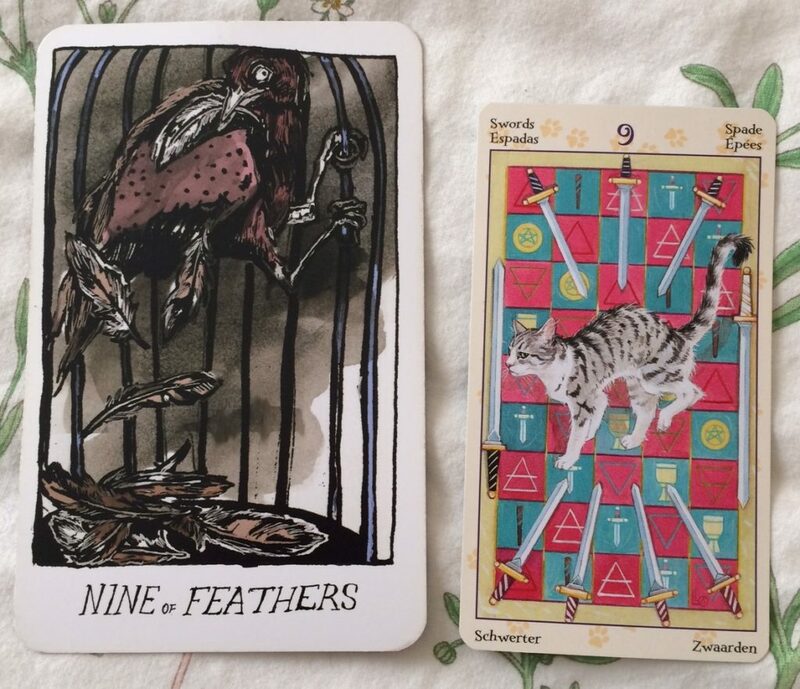 Nine of Feathers from the Collective Tarot: A bird sits in a cage, pulling out its own feathers. The meaning here is obvious: self-hatred. Whatever behavior you’re engaging in is unhealthy. You’re turning negativity in toward yourself. This can be anything from repeatedly going back to an unhealthy relationship to drug addiction to not doing basic things to take care of yourself, but what they all have in common is that you’re doing them to punish yourself on some level. Everyone makes mistakes. While it’s good to take a look at those mistakes and hold yourself accountable, you can only dwell on them for so long. Time to move forward and do better in the future. 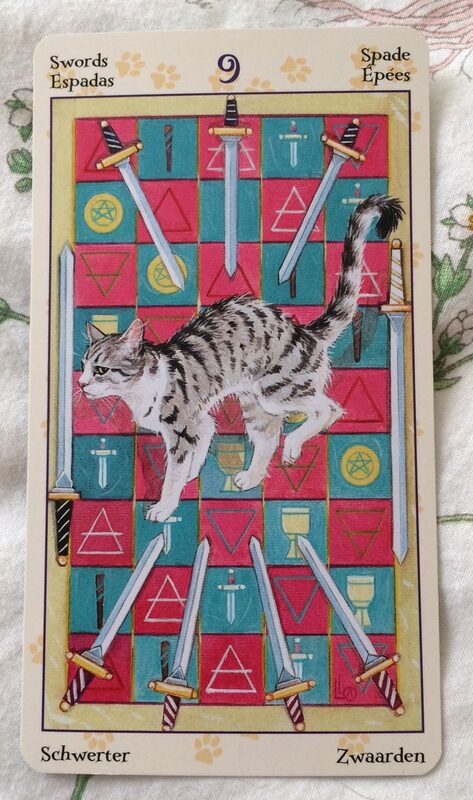 Nine of Swords from Tarot of the Pagan Cats: A cat who is clearly afraid/spooked walks over a variety of tarot-related symbols while surrounded by nine swords, seven of which are pointed directly at it. Once again, the negativity of this card is all self-generated. No external forces are making you feel the way you do, even if that is the story you’re currently telling yourself (or others). It’s about fear of the future and frustration about your current (perceived) circumstances. The future isn’t certain and the existing situation isn’t as bad as you’ve convinced yourself it is. When I see this card, there are two others that I think would be helpful to use to combat this negativity. First is the Artist of Feathers / Queen of Swords. 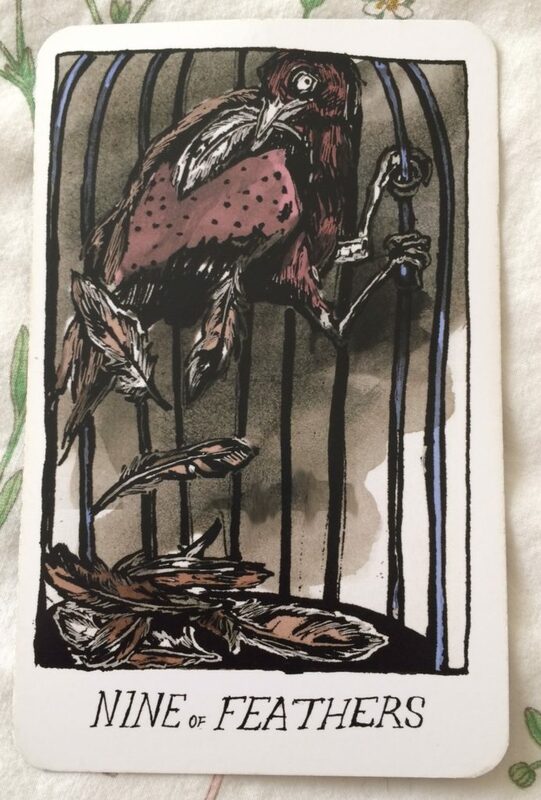 The energy of this card is sometimes seen as cold, but I read it as someone who has the ability to be dispassionate enough to see what is really happening. Channel this spirit and word on that detachment. Don’t be so bogged down in your (negative) emotions. The Magician is a good card to meditate on after that. Once you’ve gotten to a place where you can see things in a more logical way, you’ll need to move forward. The Magician empowers you by reminding you that you have the ability to manifest what you need and make your life the way you want it to be.